Open House Sunday from 2-4! Luxury Modern New Construction in Morningside! ATLANTA — The Anna K Intown Inc. Real Estate Team and Keller Williams Intown Realty welcomes the newest team member, Rachel Shirey, to the family as their Executive Assistant. Shirey joins CEO, Realtor and Listing Expert Anna Kilinski, Listing and Client Care Manager Jeff Burch, Buyers Specialist Brian Olivard and Buyers Specialist Charlotte Bair to round out their top-performing team and help push initiatives forward in 2015. “As our Executive Assistant, Rachel is solely responsible for creating the highest level of efficiency possible for the team such that our agents and other team members can focus on their area of specialization,” Kilinski said. 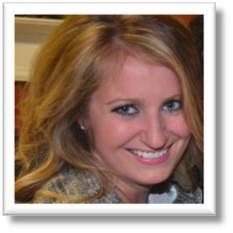 Shirey graduated from Auburn University with a degree in Journalism in 2011 with a focus on Psychology and English. She worked with Southern Community Newspapers Inc. and their satellite newspaper, The Henry Herald, through 2014 as the Government Reporter and Advertising Executive. She investigated city and county documents for financial holes and discrepancies to maintain the honesty and organization of the area’s elected officials. Shirey made it her mission to intricately monitor the county’s business on behalf of the people. Shirey now brings this skill set to the Anna K Intown team allowing them to proactively serve their clients with the highest level of service possible. Her main goal is to ensure the team becomes the go-to real estate team in the local in-town Atlanta neighborhoods and help maintain the team’s level of excellence. 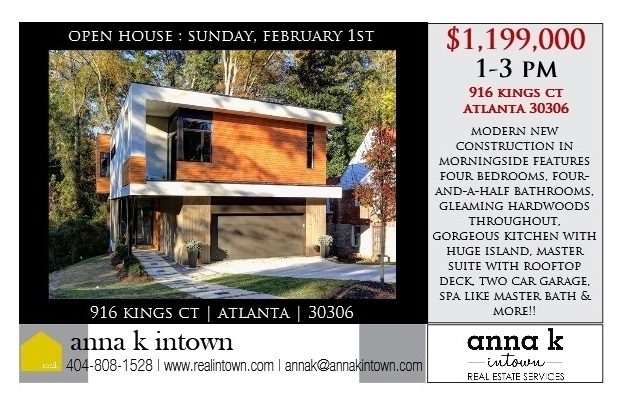 Anna K Intown’s team works together to assist clients over a lifetime in building wealth through real estate. We expect talent and results from our associates while empowering them for growth and self-development to have a life worth living and a career worth having. The Anna K Intown team was named a top five Keller Williams Southeast Luxury Agent in 2013, the No. 1 small team in the Keller Williams Southeast Region in 2012, the top 1 percent of Keller Williams International Producers from 2010 through 2014, has sold more than $150 million in residential sales and has been awarded the Keller Williams prestigious award of “Millionaire Real Estate Agent” in both 2013 and 2014, considered a rare accomplishment in the industry. 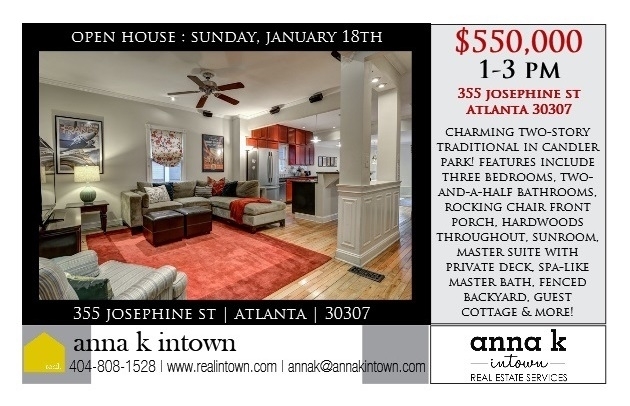 Open House this Sunday in Candler Park from 1-3 pm!